Located on the campus of York College of Pennsylvania, the J.D. Brown Center for Entrepreneurship looks to both its 5,000-student campus community and the city beyond to promote innovation and entrepreneurial activity. To accomplish its dual mission, the Center boasts a 10,000-square-foot incubator. The program offers business tenants a collaborative work environment, an analytical wet lab, tax advantages (as a state-designated Keystone Innovation Zone) and access to the college’s intellectual resources, including faculty expertise, student interns and the Center’s Advisory Council of Entrepreneurs. The incubator is currently home to three tenants: Dataforma, a cloud computing company that provides web-based business management services for the construction industry; Generation Connect, which collaborates with gerontologists to design training programs and guides that empower people through the use of everyday technology; and MRG Laboratories, developer of a patented device used to take and analyze small samples of grease from wind turbines, robots, bearings and gears. MRG Labs also provides equipment reliability training and performs analysis on lubricating oils, hydraulic fluids and machine failure. For York College students, the Center hosts specialized programs such as the Henry D. Schmidt Lecture Series, which welcomes experts to discuss entrepreneurship, liberal arts education and innovation. The Center’s Elevator Pitch Competition offers students a chance to win seed capital and space at the incubator. Students at the incubator also get to interact with active businesspeople, providing insight into the less glamorous side of startups. “The students get to be side-by-side with decision makers who they also see taking out the trash,” explains Vermeulen. 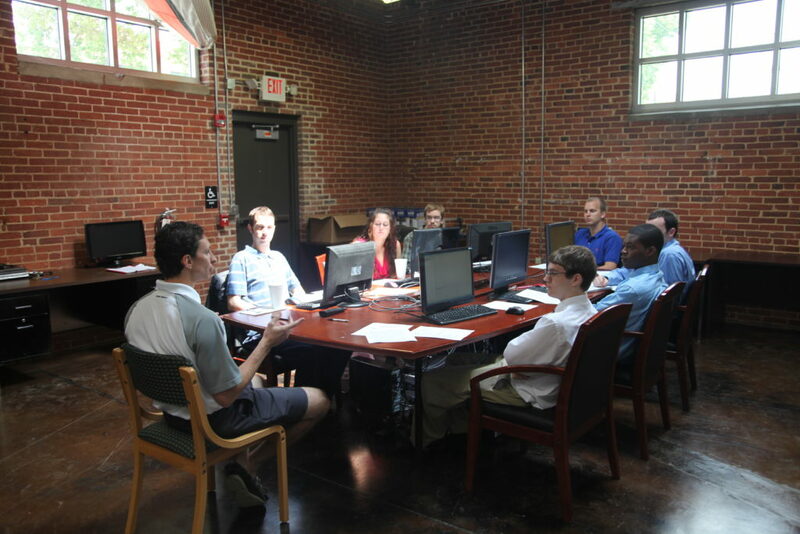 Collaboration between students and incubator companies is a win-win. For example, in developing a lubrication product for the nuclear power industry, MRG turned to a 3-D printing company then at the incubator. That company’s York College interns researched and developed a prototype that became the basis for MRG’s patented StemThief, now in use in several U.S. nuclear plants and under consideration for plants in France. Unlike some centers for innovation and entrepreneurship at large research universities, the Center is not fixated on high-stakes technology transfer and financial return. Instead, the Center aims to give its students the room to develop ideas with minimal risk.